I don't know about you but lately, just the thought of Friday night is what gets me through the week. Because on Saturdays, I don't have to race out of bed and put on presentable clothes to go be cheerful somewhere. Instead I get to stay in my PJs and be cheerful over cups of tea and leisure reading. And because the pressure's off for Saturday morning, on Friday nights, I get to knit!! I still can't believe this is what my life has become. Just three years ago, you could find me on almost any evening curled up knitting on a sofa. I had a whole office setup at my place on the sofa, in fact, with a 'drawer' at the coffee table that held my current project, my next project, a generous selection of scissors, pens, paper, markers, and darning needles, and a whole stash of kitted yarn for some future shawl or pair of socks. Now? Just the idea of two hours in the recliner are enough to drag me through the later part of the week. This weeks' knitfest was especially justified because I am FINally working on Carolyn's socks. I think she's leaving again on Saturday but it might be Thursday, so I've decided that is just cause to push everything aside but the essentials, and knit all weekend. Wondering what happened with the cable installation at the house today? Well, we did get a visit from the cable company, but the gentleman who was at the house yesterday is not the gentleman who came today, so the learning curve was set back to the beginning. Also, the deserted house of yesterday was a house getting soffits today, via a ladder right where the cable needs to go. The new guy didn't know it was going to take two and a half hours until he arrived, and didn't want to work while the soffit guy was there (and frankly, even though the soffit guy was very nice, I don't blame him), so he is coming back Monday. Or maybe it will be yesterday's guy. Or an entirely new one! I made a special request that it be noted the job will take two and a half hours, but who knows whether there will also be a note about it being a perfectly safe work site. Back to the socks. 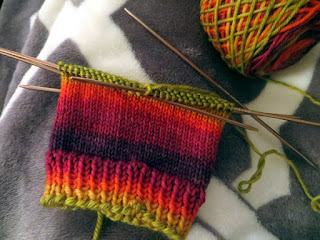 I have been drawing on old habits for these socks, like knitting while walking and carrying a knitting sack from a loop around my wrist to aid in that endeavor. 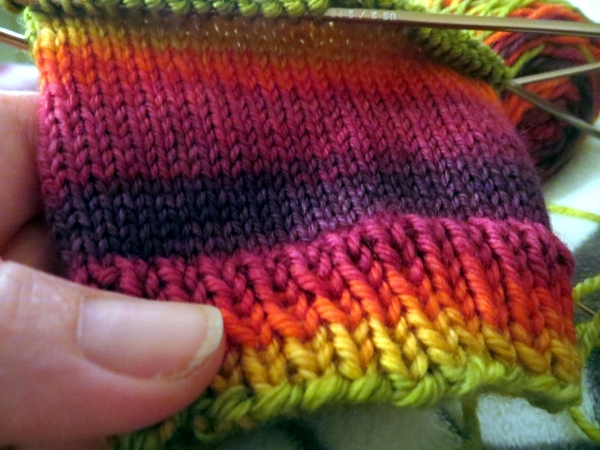 It's all coming back so easily, like it was yesterday I was a crazed knitter, instead of just a thwarted one. And I'm so pleased with the fabric I'm getting. This is the last of my stash of Twisted Fiber Art's 'Duchess' yarn, a lovely DK weight that comes out very dense on my needles and feels like I imagine butter would, if butter were yarn. Probably it's good that it isn't because that would make for pretty weird looking toast. Anyway, Twisted discontinued Duchess so this is pretty much End Of An Era here at Hugs. Let's just enjoy it while we have it, right? Hope you've had a good week and have a perfect-for-you weekend planned... see you sometime Monday, hopefully with cable running to the house from the pole in the lane. HA. A girl can hope!